Build your knowledge of the fretboard from the very ground up. Steve Stine, highly sought-after guitar educator, teaches live group and private classes at LessonFace.com. Welcome to the second installment of my "Absolute Fretboard Mastery" series. In our last lesson, we ran through the five major and minor pentatonic scale patterns and covered a technique called "meandering." I hope you’ve practiced hard and you’re ready for this next lesson in the series. In this installment, I want to continue improving your knowledge of the fretboard by touching on the topic of chords. Most of you probably know all your chords, but what I want to do with this series is really build your knowledge of the fretboard from the very ground up. So, as with the last lesson, we’ll be starting off with the basics and making sure you know all your chords with absolute certainty. Let’s start off by learning the essential 10 open chords—these include six major chords (A major, C major, D major, E major, F major and G major) and four minor chords (A minor, B minor, D minor and E minor). The first step when learning these chords with our concept of absolute understanding is being able to visualize them across your fretboard; the same way we did with the minor and major pentatonic scale patterns. At the end of the day, you need to be able to look down at your fretboard and instantly visualize where these chords are. The second step when learning these chords involves a little technique that I call "bouncing." When it comes to learning chords, muscle memory is a huge part of the process; which means that your fingers need to be able to instinctively form the chord shapes as soon as you decide to play them. What a lot of beginner players do when learning chords is that they hold a chord and strum it over and over again. The problem with doing this is that it really isn’t teaching the muscle memory involved with the chords to your fretting hand. With "bouncing" what we’re going to do is first hold the chord and then slightly raise your fingers off the strings, while holding the chord shape, and then set them back down again. 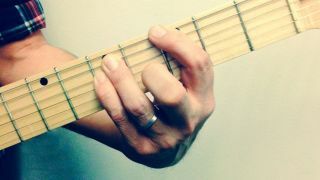 By doing this you’re improving your fretting hand’s muscle memory so that it’ll be able to form these chord shapes quickly and accurately. The third thing I want you to work on when learning these chords is the clarity with which you play them. What I want you to do here is to hold a chord and then strum it string by string. This way you will be able to hear if you’re holding down on each note of the chord accurately. Once you have these 10 open chords mastered, I want you to start learning the basic sixth-string and fifth-string power chords. You’ll notice that with power chords that we’re only playing three strings. For example, with the sixth-string power chords we’re only playing the sixth, the fifth and the fourth strings, so it's important that you lightly touch the remaining strings to deaden them out so that they do not ring out. It’s the same for the fifth-string power chords, and I like to go a step further and lightly mute the sixth string by touching it with my index finger so that it doesn’t ring. The great thing about power chords is that you can move them around anywhere on the fretboard. And this is why I wanted you to learn the notes on your sixth string in the last lesson. Because the first note of the power chord is its root note, by knowing your notes on the sixth string you are able to play virtually any power chord. For instance, if you’re playing a sixth-string power chord on the seventh fret, which is a B, you are playing a B power chord. In the same way, once you learn your notes on the fifth string, you can play virtually play any fifth-string power chord you want. So another task that I want you to focus on this month is learning all the notes on the fifth string with absolute certainty. And since you’ve already learned the notes on the sixth string, you can start cross-referencing notes across these two strings. So when you’re locating a note on the fifth string, immediately locate the same note on the sixth string. And as we continue learning notes across the rest of the strings you’ll be able to see the notes across your fretboard vertically as well as horizontally. This will all contribute toward your absolute knowledge of the fretboard. Again, I understand this might seem basic to intermediate and advanced players, but these first steps are crucial toward absolute understanding. The next topic I want to cover in this lesson is that of the major, minor and major 7th barre-chords on the sixth string and fifth strings. If you take a close look at these chords and the notes that make them up, you’ll notice that these barre chords are actually open chords moved up the fretboard. For example, the sixth-string major barre chords are actually the open E major chord moved up the fretboard. You’ll also notice that the power chords we learned earlier are actually the same as these barre chords. For example, the first three notes of an F major power chord are the same as the first three notes of an F major power chord. The barre chord simply bars the remaining strings and adds the note that makes the chord a major or minor. So while power chords aren’t differentiable as major or minor, barre chords are, and generally have much fuller and more expressive sounds. For the second part of this lesson, I want you to go back to the "meandering" technique I spoke about in the first lesson of this series. But this time around I want you start introducing little stops and pauses into your "meandering" to create melodic phrases. While doing this I want you to pay attention to the length of each phrase and aim to vary your phrases as much as possible. This is a crucial first step in making sure that your playing doesn’t become too rigid and monotonous. I hope you enjoyed this lesson, and I really hope that you do practice hard. And remember, sometimes it can feel like you’re learning things that you already know, but powering through that feeling is a small sacrifice when you realize that you’re laying a solid foundation to truly great playing. Steve Stine is a longtime and sought-after guitar teacher who is professor of Modern Guitar Studies at North Dakota State University. Over the last 27 years, he has taught thousands of students, including established touring musicians, and released numerous video guitar lesson courses via established publishers. A resident of Fargo, North Dakota, today he is more accessible than ever before through the convenience of live online guitar lessons at LessonFace.com.